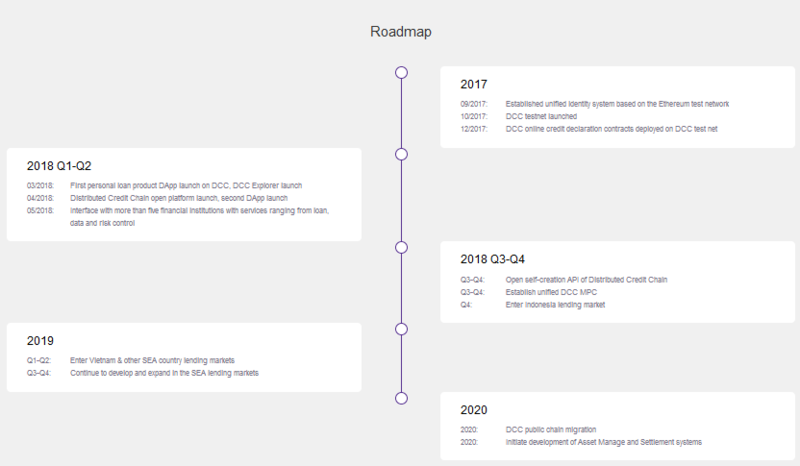 Distributed Credit Chain [DCC] is a blockchain project that aims to change the financial space using its platform to transform distributed credit reporting, debt registration, wealth management, and asset transactions. DCC is will create a decentralization system for suppliers of financial services throughout the world. By expanding the capabilities of blockchain technology and bringing back the data rights of individuals, the MISSION- distributed credit chain should change the various financial scenarios and implement real financing. As the world’s first distributed banking public chain with a goal to establish a decentralized ecosystem for financial service providers around the world has arrived. 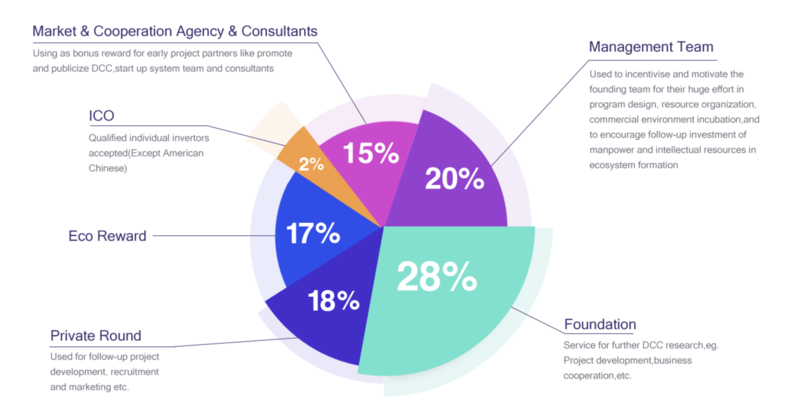 The traditional financial industry is highly centralized. With substantial transaction fees paid out to large financial institutions, financial transactions rely heavily on the endorsement and support of these institutions. In fact, lending rates for borrowers are raised while reducing the interest income for lenders by the monopolistic financial institution. In some cases making it impossible for lenders to accurately identify the risk, the intermediaries have even distorted the credit rating of borrowers for their own benefit. This monopoly has broken by the public chains for distributed banking based on blockchain technology. DCC can practically abolish transaction costs and commissions as the first ever distributed blockchain financial service platform. It can provide secure and convenient service that’s affordable for traditional financial institutions. All financial services firms have equal status on DCC’s public chain. There are no longer a monopolistic few who “control the whole”. The value of the DCC comes from the financial activities and transactions of all its members. The DCC digital currency will have a more concrete foundation due to increasing numbers of financial transactions which are completed via DCC. With the flow of large sums of financial capital, at present socio-economic operations go hand in hand. This brings DCC a broad range of potential commercial applications and invaluable potential. This is the beginning of the commercialization of blockchain technology. DCC can become a high-quality digital asset which is worth holding on to in the long term with their huge market demand and by eliminating the key weakness of traditional digital currencies. To create an address each individual or institution has one DCCID generated through Public-Private Key Pair in DCC. This is just like a member ID in a traditional internet system which identifies and associates various real-world attributes and information on the credit chain. 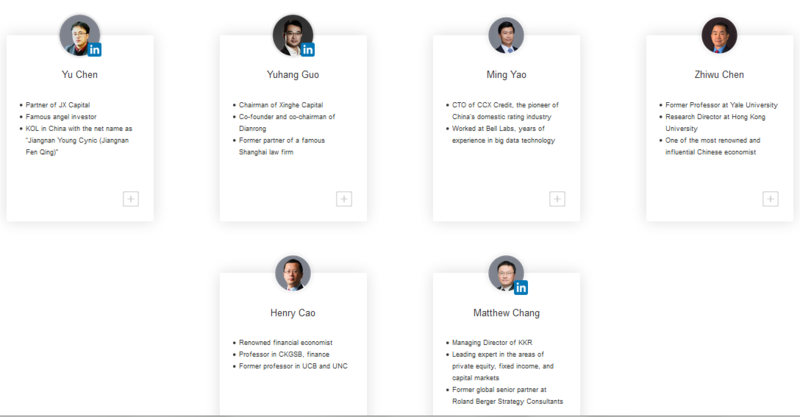 DCCID is a decentralized account system, and its generation does not depend on any individual DCC node. Any person, organization, or company can generate this DCCID offline. To fully guarantee the non-repudiation of an individual chain, DCC uses digital signature technology at every step of data exchange. 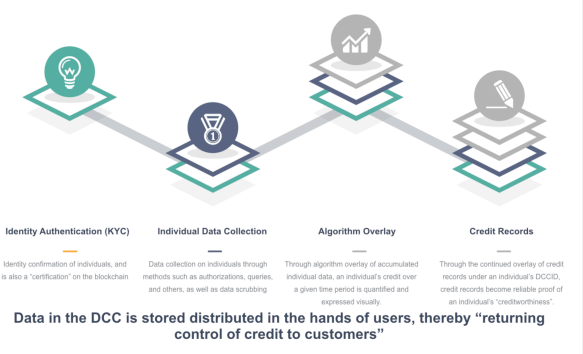 An open source personal credit data management framework which is called Distributed Credit Data Management Framework will be provided by DCC and it is supported by a specific cloud storage provider and developers. This is able to quickly rebuild users’ personal credit reporting data using DCDMF based on their APP development needs. By exporting the wallet addresses, users having a DCCID can exchange data in several APPs which use DCDMF. Distributed credit data management framework or DCDMF is provided by DCC. DCDMF use to rebuild users data report. Users can take data any time they want using their user ID and password. Users have the authority of data via Distributed Identity Verification (DIV) and can determine the content. In this DIV process, there is no third party involvement so the data directly passes to the user from data institution. Distributed Credit chain make sure data generated in the blockchain is accurate. Data leakage is minimum during the process. Because data only passé only between individuals and data institutes. n the other hand, data reports can use again by data institution. DIV pave the way to use data services by big data companies and AI-based companies. Easy access to personal data — Users can access this information at any time without contacting credit agencies. Improved security- Information stored in one place is not protected from hackers. A striking example is Equifax, which was hacked in 2017, and attackers unveiled social insurance numbers of all customers. Favorable rates on loans — Integrating many financial organizations, the platform creates an environment based on competition, rather than collusion, which is customary in the traditional financial sector. Due to this, customers will choose companies offering favorable conditions, and centralized organizations will weaken their grip.